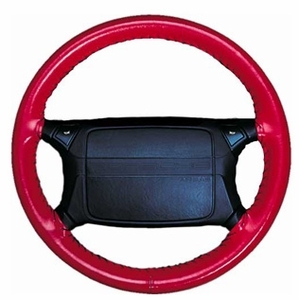 These are the finest, most luxurious Genuine Leather Steering Wheel Covers available. They are individually hand-crafted in of choice domestic cowhide, especially tanned for Wheelskins. Their exclusive patented lacing hole reinforcement system ensures a tight custom fit on any steering wheel. Easy to install, these are the best way to inexpensively customize and upgrade any plastic steering wheel or replace cracked or worn shift boots. They are also the premier option for replacing a damaged or worn original factory leather covered wheel. These come in thirteen colors and six standard sizes. Use our measure guide to help you determine the correct size for your wheel. Orders shipping to California will be charged tax.